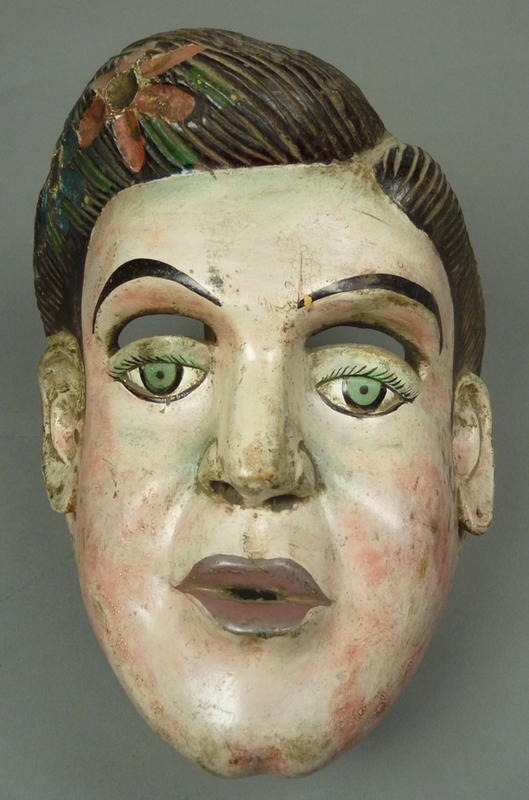 Recently a remarkable female mask turned up on EBay™. It depicts a beautiful Caucasian female face, which has been carved with extreme delicacy. One would not doubt for a moment that it was carved by a santero, an artisan whose primary occupation was the carving of wooden statues of Christian saints. The seller, who was also offering several masks that were clearly in the style of Carlos Reyes Acoltzin, a santero from Tlaxcala, Mexico, attributed this mask to that artist. However, although this is a superbly crafted mask, it is not typical of Acoltzin’s style, nor is it particularly similar to other Carnival masks from Tlaxcala. Those masks often lack carved ears, and when ears are present they not so elaborate. If it were several inches taller, I would think that this mask was worn by a Borracha in the Toritos dance in the area of Sileo, Guanajuato. (see my post of December 4, 2017). After staring long and hard, I am doubtful that this is a Carnaval (Carnival) mask from Tlaxcala. It is probably a Female Huehue or Carnival mask from the Sierra de Puebla, where carved ears are the rule, rather than the exception. In that case it could have come from either the Mexican State of Puebla or from that of Veracruz. There is the possibility that it is a Maringuilla mask from the state of Michoacán, but they don’t usually have ears either. Faced with such ambiguity, I usually look for carving details like these to point me in one direction or another. What is it that makes this mask so different from the familiar styes of Tlaxcala, Michoacán, and the Sierra de Puebla? The most obvious difference is the expression of this face, so serious or even haunting! If I only look at this expression, then I think that this is a mask of an Angel, who has come to tell the Virgin Mary serious predictions at the moment of the Anunciation. 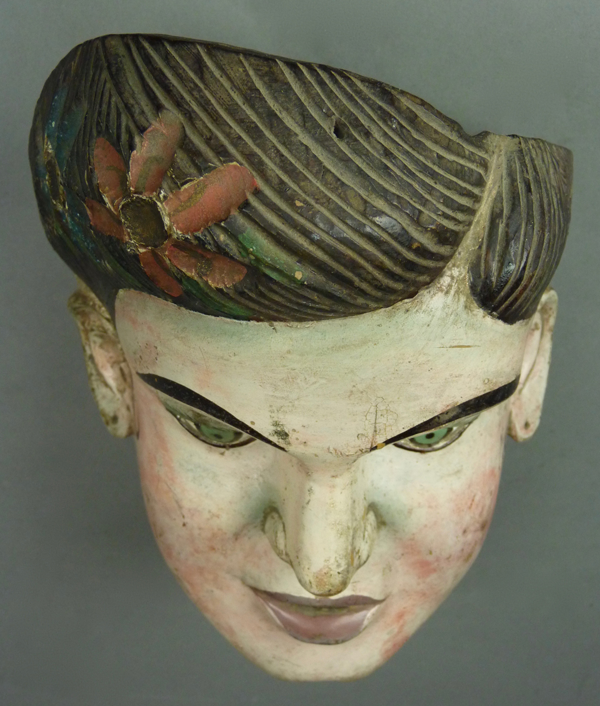 The EBay seller, equally impressed by this expression, nicknamed the mask—”Elvis Lives.” Both of these hypotheses are punctured by the jarring discrepancy of the carved flowers in the hair, another unusual feature. In passing, note the asymmetry of this mask. This does seem to be a mask of a female (and not Elvis) on at least three counts—the flowers in the hair, the lipstick colored lips, and the holes in the earlobes for earrings. 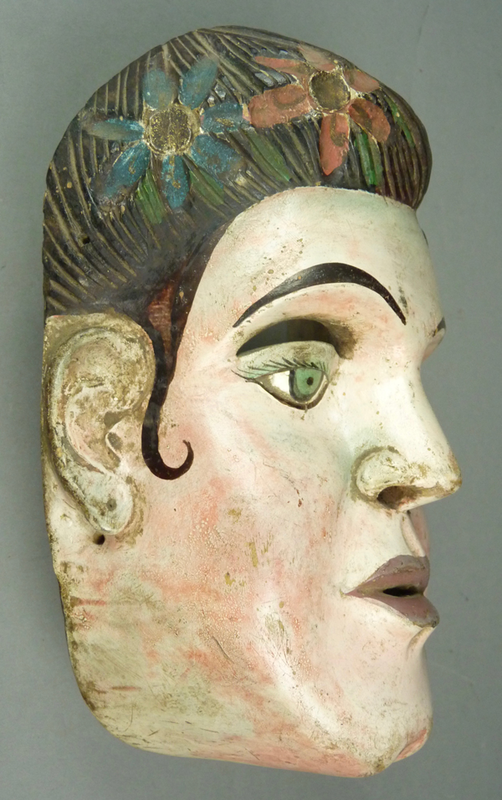 In the Sierra de Puebla one finds many distinct variations in the carving of the ears on a mask, which cover a wide range from clumsy to exquisite. I have seen ears by other carvers that were just as beautiful as these, but I have never seen another mask that has these ears. 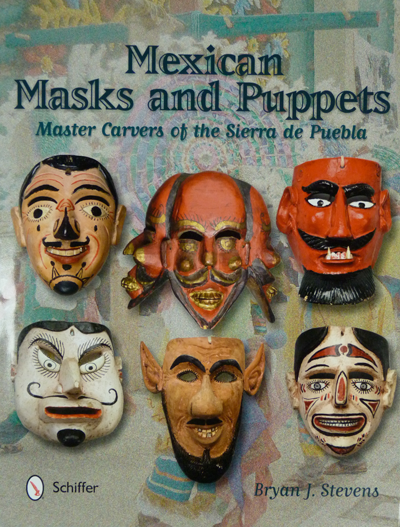 Masks by Magno Leon of Puebla do look a lot like this mask, but yet slightly different. The glossy paint used on this mask is unusually elegant, definitely the work of a santero. These flowers in the hair have round disks of leather inlaid in their centers. I don’t know whether there was once something applied to these disks, such as plastic imitation jewels. 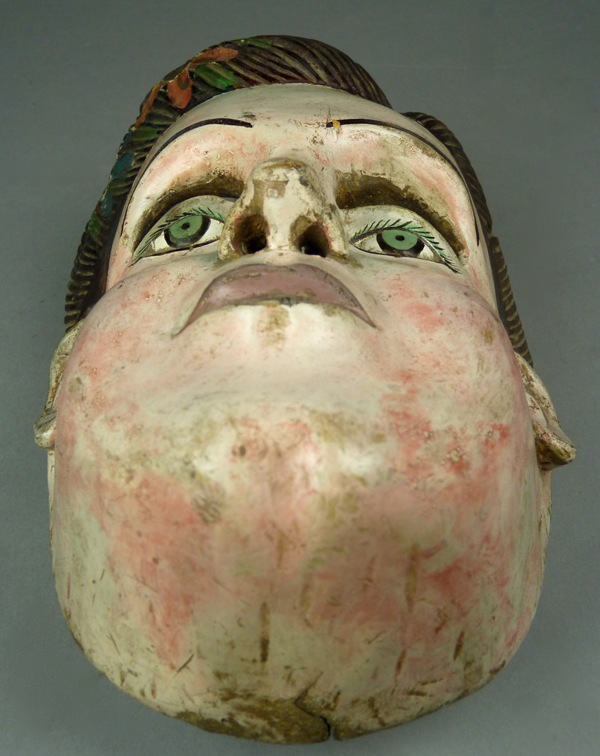 This mask is 9 inches tall, 6¼ inches wide, and 3 inches deep. The back of this mask is heavily stained from use. The shape from the back is remarkable, and unlike any that I have ever seen. This back has been carefully shaped to fit a human face, but it was not smoothly finished, which is in dramatic contrast to the face. This combination of perfectionism on the face combined with an imperfect but functional back is common in masks from the Sierra de Puebla. In contrast, those from Tlaxcala ordinarily have highly stereotyped backs that are smoothly finished and frequently painted. 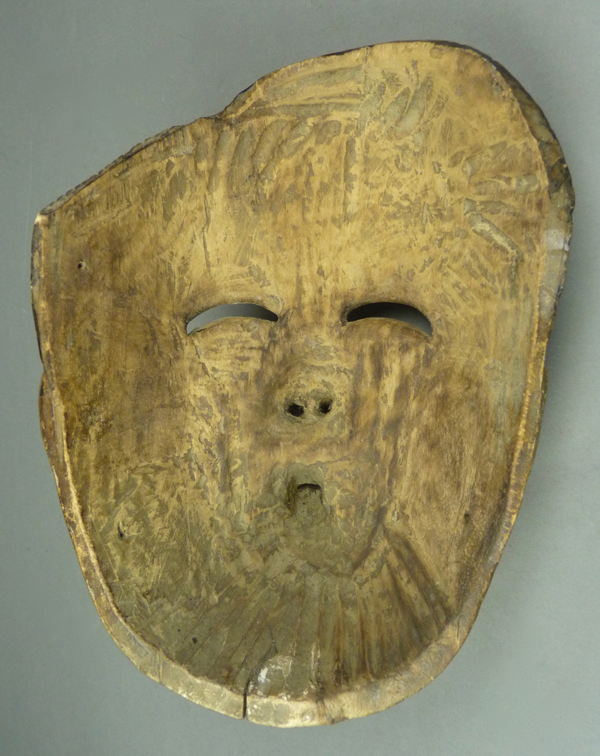 Next week I will resume discussion of Rio Mayo Pascola masks.